... and returned with stone tablets (or maybe just actual running-on-batteries tablets) with the Ten Commandments. Literary, obviously. Thou shalt not have only one book. Thou shalt make unto thee vivid images of the book worlds you immerse yourselves into. Thou shalt not take the name of authors in vain. Remember World Book Day* to keep it holy. Thou shalt honor thy favorite authors. Thou shalt not destroy a book. Thou shalt not lie about how much money you really spend on your book splurges. Thou shalt not covet your neighbors' state of the art electronic reading device. I dare say, I pretty much covered all the important rules of conduct when it comes to being a virtuous reader. The question being - how virtuous a reader are you? Have you ever broken any of the above commandments? Please share. P.S. 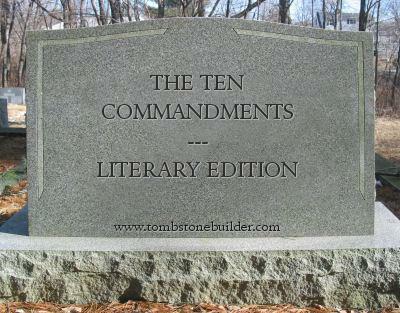 : Feel free to share my Literary Commandments on your own website, but please link back to my blog - thanks! I've only ever been to one smallish convention in Vienna and there were NO free books to be had, but those large events overseas ... if you ask me, some people who go there are just plain greedy and grab every available book no matter if it interests them or not. Not to say I'm not a little envious, but that's because of the whole ambiance and the possibility to meet authors, not about the freebies.